It’s important to motivate children and teens to succeed and do what they love, but a recent newscast in NPR talks about the risks of pushing kids too hard to do well. (The NPR newscast includes a 7-minute talk about this topic which you might find interesting!) It is not a stretch to say that students today feel immense pressure to compete against their classmates and friends to do well, and this stress can be a major contributing factor to anxiety and depression. Some parents admit that they “totally bought into the idea” that their job is to push their kids to succeed and overcome obstacles. But if the pressure is too much, this effort can backfire. One high school in New York invited a psychologist to evaluate the student body using the Youth Self-Report, and found evidence of high levels of stress. This includes internalizing symptoms, or feelings of sadness, anxiety and depression; physical symptoms like headaches and stomachaches, and drug and alcohol use. According to experts, substance abuse is actually something that affluent teenagers may use even more than inner-city kids, as “a form of self-medication” against the stress of high expectations to do as well as peers or parents. This means that the need for conversation around mental health applies to inner-city and wealthy suburban schools alike. Student-directed initiatives also give students an opportunity to talk with each other about topics they might not readily share with parents or teachers, and gives them an active role in their own mental health. All of these efforts should be directed towards valuing well-being and celebrating diverse kinds of passion and success. As a society, we should acknowledge that “a culture shift” is necessary to value all kinds of success instead of prioritizing and zeroing in on certain academic successes or career paths. Fall is a time of many changes, from the weather to the new school year starting. This year, though, it has been an especially anxious time. On the heels of successive events such as the effects of natural disasters and ongoing recovery efforts, the senseless tragedy in Las Vegas, and political divisions especially within our government, children listening to the news lately would likely alarm parents with questions. It’s not a stretch to imagine the impact these events can have on societal and children’s health: federal funding for health insurance for many children is still up in the air; food and water are in short supply in Puerto Rico; and gun violence has become a public health issue and its impact on children is hard to ignore. There is no real advice to be given in times like these, but there are many conversations parents, educators, and caregivers can have with children to talk about stresses from these events. At CHIL, we hope that adults and children alike embrace the fact that people impact lives more directly than any policy change can, as dramatic as the latter may be. Mindfulness is always important but feels especially relevant today. We hear a lot about the obesity epidemic in the United States, especially among children and adolescents. However, the impact that school meals have on childhood weight and overall health has been overlooked. A piece in the Wall Street Journal earlier this year looks at five creative ways schools can encourage students to eat more healthily. These interventions have been formulated to help schools meet the guidelines under the Healthy Hunger-Free Kids Act of 2010. Salad bars that feature at the front, or in the center, of a school lunch line are much more likely to attract students. Some Maryland elementary schools opened all-you-can-eat salad bars that featured five different fruits and five different vegetables a day and saw the number of students buying salad go up. In fact, one study found that strategic placement of vegetable options can increase consumption by as many as five times. Other schools planned the timing of vegetable snacks, so that hungry students were more likely to reach for them before a meal. Changing children’s preferences can be as simple as slicing up fruits for those with orthodontic appliances, or using more colorful bins to display fruits at lunch. “Stealth nutrition,” according to the WSJ piece, can also come in the form of food names that appeal to a young crowd (e.g. “X-Ray Carrots or Turbo Tomatoes.”) Attention-grabbing cartoon stickers on fruits can also increase consumption. This is an intervention that can reduce waste, and at the same time, determines which foods are popular with students and which are not. Researchers at some Chicago elementary schools recorded what foods were purchased and thrown out in order to determine the relative popularity of certain food groups. Such measures can also increase parental involvement: some schools send home weekly report cards that record what a child ate throughout the week, based on lunch swipe summaries. Instead of remaining in the dark about what their children eat at school, parents can talk with their children about their meals or even compensate for missing nutrients at home. Children can’t be expected to enjoy food that adults would also avoid. Chefs can consult for school menus or cook directly in schools. Over time, partnerships with chefs and local food sources can have a big impact. Nutrition education should not have to be boring. In fact, it absolutely should not be, since a child’s first impression of a food item is crucial. Some elementary schools have started taking students on field trips to local farms, teaching ways of sustainability along with familiarizing students with new fruits and vegetables. They encourage students to make note of how a fruit smells, or what color a vegetable might be. In NYC, the Wellness in School Program encourages students to make healthy choices for themselves based on what they observe in the fresh produce and nutrition labels they encounter. This year, we got kids to become more physically active through yet another successful Step It Up pedometer program. 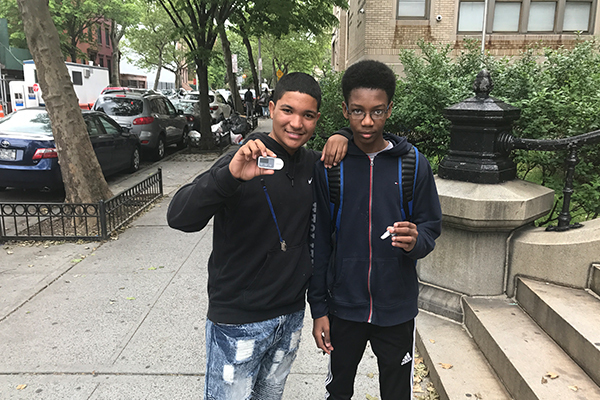 We worked with two schools and one community-based organization, and provided students and teachers with 200 pedometers this year. Throughout Step It Up, we have spoken to a student, teachers, and a social worker about their experiences, and found that pedometers more than increased physical activity among participants. Step It Up helped students become more competitive, learn about goal-setting, and encouraged students to collaborate with each other to work as a team. We would also like to give a huge thanks to the everyone who participated and supportedStep It Up. Thanks to you, we are one step closer to getting more kids moving and forming healthy habits. Back in April, we wrote about how American households are not immune to the phenomenon of food insecurity. A recent New York Times piece discusses the importance of school meals in students’ development and learning. The benefits of having ready access to nutritious meals are, according to a research team at the University of California-Berkeley, threefold: “physical development” (e.g. eyesight), “cognition” (concentration and memory), and “behavior” (hyperactivity) are all directly impacted by what a student eats during the crucial formative years between kindergarten and high school. When Michelle Obama was the first lady, she started health initiatives in school districts nationwide by setting up programs that incentivize schools to invest in healthier options for students. These programs did indeed have an impact: one study found that simply moving the salad bar from the margins to the middle of the serving area increased uptake. However, the current Congress has taken steps to dismantle many of these initiatives. It is surprising that a topic as seemingly uncontroversial as student nutrition could be treated as a partisan issue, especially given the fact that experts from multiple disciplines agree on its importance. Funding is certainly always a factor, as school budgets face real challenges in delivering quality education with limited resources. However, research shows that some of the objections to healthy meals are untrue. If we think of student nutrition as an investment in their academic and personal development, and by extension, an investment in the future of society, prioritizing student health should be a no-brainer. It’s as clear as the very benefits of healthy food. NPR recently discussed some of the challenges and opportunities facing teachers of students who may have been exposed to trauma. In New Orleans, where public schools have largely been replaced by charter schools after Hurricane Katrina, schoolteachers have become accustomed to having students who may have experienced abuse or neglect, have absent or jailed parents, or have witnessed crimes. School discipline policies that previously only focused on a child’s errant behavior are now undergoing an update that takes these environmental factors into account. There are currently five charter schools in New Orleans that are seeking to become “more trauma-informed.” In other words, these schools are starting to incorporate knowledge about their students’ lives outside of school in order to address their social, emotional, behavioral, and development needs. These changes are bound to have an impact, considering the fact that children in New Orleans screen for post-traumatic stress disorder (PTSD) at three times the national rate. Mental health experts and workers have only recently begun to understand that trauma dramatically changes the brain and intensifies the fight-or-flight response in young children. Children with exposure to trauma might be disruptive in school, or they may be withdrawn and inattentive. Teachers are learning to look for signs of both ends of the spectrum and everything in between. They are also engineering new ways to resolve conflict instead of resorting to detention or suspension since sending a child back to a damaging home environment is not the best way to solve problems in the long run. For example, some teachers begin classes with social-emotional learning, and students in disagreement are invited to use group discussion to resolve their problems. Another way teachers are approaching disruptive students is by renaming “time out” as “wellness centers”, and multiple teachers collaborate with each other to work the same students over the course of a day. The article also details the moving stories of students who have seen real change with this type of support that they cannot find at home. Certain statistics aside, this story is not unique to New Orleans. In many urban areas, when children experience poverty and hardship, and there are desperate consequences at home and in their daily lives, teachers everywhere can be heroes that foster a “home away from home” in their classroom. However, these New Orleans teachers and schools have ventured into an unknown space in their mission to understand each of their students, and to address a holistic approach to health. By addressing issues, and not punishing students, a very challenging method, teachers play a vital role in the health and well-being of their students.